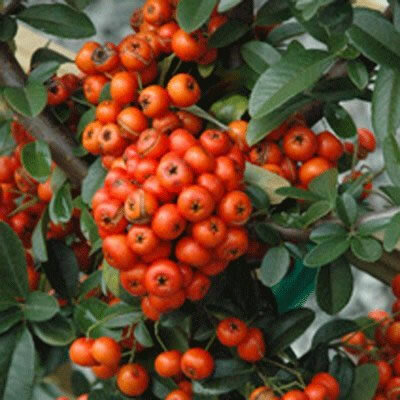 Firethorn. A vigorous bushy shrub with dark green leaves. Clusters of white flowers are produced in early summer followed by red berries. Height: 4m. Spread: 5m. Flower colour: White. Flowers from June to July. Fruit colour: Red. Fruits from July. Evergreen. Foliage colour: Green. Hardy. Shelter from cold drying winds.